Tonight’s American Masters episode, “John Muir in the New World,” concluded as required with an accounting of Muir’s failed quest to keep this dam from being built in Yosemite National Park’s Hetch Hetchy Valley. The leading experts agreed that some good came of it: at least no more dams (hmm, I keep wanting to spell it “damn”) were built in our national parks. Comfort about as cold as the water flowing out of those giant valves in the concrete. These days a lot of people want to tear down the dam with, I suppose, some hope that in a thousand years the last water lines on the valley’s walls will have washed off and all memory of the mistake scrubbed from the history of our kind. I’ve argued in the past we should leave it stand as bleak testimony to the costs of our so-called civilization. I’m not sure what I think lately except to note that whichever creatures dwelling in the reservoir now will not cast a vote on the final decision. 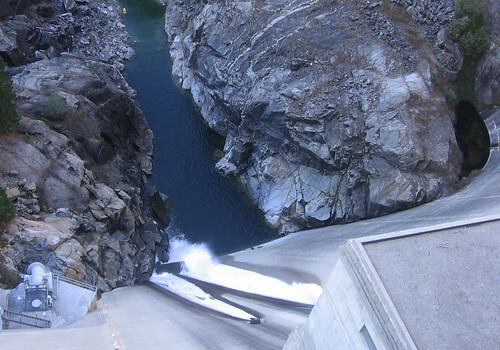 What I do know for certain is that the dam clogging the Hetch Hetchy stands as a monument to our species’ tendency to trash our future if it yields convenience today. That’s what’s really at stake in the battles between the tree-huggers and the drill-baby-drill crowd. They cut down magnificent redwood forests around the San Francisco Bay Area because, basically, the wood was nearby. It’ll be 50 generations before any humans walk in a forest like that again. If any humans are left. Our ancestors built this dam — people just like us separated by barely a century. Any day now our neighbors craving cheap gasoline will be clamoring for much worse to squeeze petroleum from the layers beneath the Rocky Mountains. I wonder what would happen if each of who hikes dragged a few non-hiking pals into the woods enough times to get it into their heads that wilderness is worth keeping around so our great-great-great grandkids can have it as good as we’ve got it. I think John Muir wondered that too. I feel the exact same way about Glen Canyon Dam. Muir definitely had a long-term view of things few (even now) could really grasp. Thanks a ton for your insight. You’ve hit the nail right on the head. I couldn’t agree more. If the dam isn’t evidence enough for the drill baby drill crowd, how about the Deep Water Horizon incident. Rather than look for more oil or depend on foreign oil, I believe we should be looking for alternative fuel sources. But today, this maxim is turned on its head – in our mechanized, industrial, drill-baby-drill reality, we have a deadened world in which we strive to contain, zoo-like, precious remnants and vestiges of the natural wild. And that, especially, includes nature, in that Orwellian nightmare.